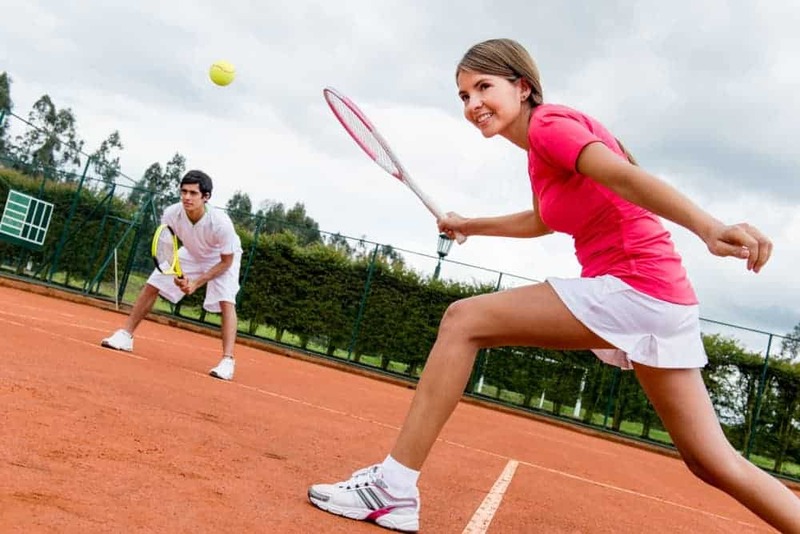 The sport of tennis is played on many different services, creating strengths and weaknesses in playing styles. The more agile player will benefit from the speed a grass surface offers. Clocking a high service speed keeps the ball low, causing for quick decision-making skills on this surface. A hard surface or clay court creates more bounce from the ball, creating for more instances of complete body movements. The surface also plays a large role in proper shoe selection. Lighter surfaces, like grass, will demand less from your shoes. Hard surfaces beg for additional supports and product upgrades. Below is a brief look at shoe to sports association with tennis. This guide will also develop certain aspects you should be looking for in the shoe selection process. ​Adidas introduces a selective balance in the construction of their Barricade Club tennis shoes. This shoe houses all of the elements one would look for in a dual-surface shoe, hosting performance on all court types. The construction starts with the unique attention to the outsole of the shoe. The undercarriage is lined with a grooved pattern that makes wavy cuts into the bottom of the shoe. These cuts and shapes fully extend to all areas of push-off and landing, creating a traction measure that can be noticed under any circumstance. The reinforcement introduced at the outsole is also very meticulous. It reinforces rubberized materials and even adds a gel-like shock absorber at the heel location. It is both layered and features the proper mode of support in the front and back of the shoe. The lightweight nature of this shoe is also something users can get behind. It is constructed of textile materials that keep the total weight of the shoe low. Even though the weight is low, the coverage remains fluid. The backing rises to house most of the ankle, finding a happy medium in between low-profile and high-profile design. The insole is very thin but features an even pattern of support from heel to toe. The insole is also removable for those desiring the inclusion of a different support system. ​The ASICS Gel-Dedicate 4 is everything you're looking for out of a clay surface tennis shoe. It offers an incredible amount of support at the insole, introducing a gel-like insert that fully grips the bottom of the foot. This gel-like insert is thick, fully cushioning the bottom of the foot. It also introduces the proper outsole for the prescribed surfaces. The sole is rubber and holds dual layers of reinforced material to separate areas of focus. It is thicker in the front and back of the foot than it is in the middle. The middle, or midsole area, features the proper amount of hike for increased arch support. The out covering of the shoe is comprised of synthetic materials. These materials are layered and padded, increasing the lifespan of the shoe. This model is a perfect opponent for standing up to the test of time and producing the correct amounts of supports and stability measures need for the hard-court surfaces. ​Sketchers introduces a submission to the field of a dual-performance tennis shoe with the introduction of their Burns Agoura product line. This shoe carries a comprehensive outsole, creating a thick substance of foam-like materials for support. The undercarriage of this notion is greeted with spaced out grippers. These grippers take the form of blocks that fully cover the bottom of the shoe. This helps space out the pressure on any given portion of the foot and will withstand slippage from grass surfaces. The inner portion of the shoe houses their revolutionary memory foam technology. This material is reinforced and stacked, creating a foam that greets your foot and forms to the shape of your foot each time you wear them. The outer casing of the shoe is comprised of both synthetic and textile materials. This material make-up is reinforced and layered, producing a covering that will protect the foot against outdoor elements. ​A comprehensive list of product reviews in the tennis space is not complete without the inclusion of one of biggest tennis brands, Wilson. Wilson has contributed greatly to the tennis space and their submission of the Kaos Composite tennis shoe is nothing short of their commitment to quality. The design starts with the rubberized outsole. It is thick in nature and contributes a pattern of grooves on the undercarriage. This notion allows for the shoe to compete in dual-surface methods, being used on both clay and grass surfaces. Continuous draw is shown in the backing of this shoe. It introduces forefoot stability measures that help keep the ankle and entire foot stable and locked into the shoe. This reduces the instabilities that often arise when making shifty movements or direction changes during match play. The foot also sits low to the ground, allowing you to find stability on slick surfaces. New Balance is a major player in the tennis shoe industry and their introduction of the 696v3 tennis shoes bring the necessary elements of support to the grass court surface. The discussion surrounding the softer surfaces was creating the proper undercarriage for stability and grip. The bottom of these shoes contains wavy grooves that are spaced and spread out. These grooves contradict each other in direction, but their coverage remains all-encompassing. This is important for creating an even distribution of stability measures and to prevent slippage. The shoe also introduces an evenly distributed support system. While the support system is thick, it holds true throughout the shoe. This keeps you light on your feet and adapted to perform quick shifts and movements. Heightened attention is focused on the back-heel portion of this shoe. It houses a very thick padding that form fits the ankle. This keeps you fully grounded within the shoe and prevents the ankle from making adverse movements. From the video, we gain a better understanding of shoe make-up. This video does a great job of presenting features and briefly entertaining these aspects will a description of usage. Now we will pivot into a more detailed discussion surrounding surface to shoe advantage and other such aspects of importance. 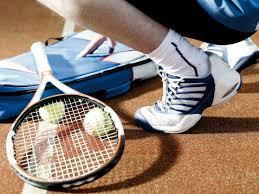 There are three popular surfaces that a tennis player will host a competition on: hard surfaces, clay, and grass. For the sake of discussion, clay and hard surfaces will be treated as one, due to similar properties. The hard surfaces represent an area that begs for a solid support system. Three common areas of support reside in the outsole, midsole, and insole of the shoe. The outsole is the area where you can find a system of support. These support system range in material make-up with rubber and foam-like technology comprising a majority of shoe models. There needs to be a pronounced amount of support in this area, usually marked by a thick sole. The hard surface carries little give, relying on heavily on your feet during play. This surface also represents a location that increases the amount of wear and tears on your shoes. To withstand the additional pressures and increased usage rates for shoes and feet alike, it is important to have a sturdy, strengthened, and reinforced outsole. The midsole is where your main arch support is located. It is usually raised and creates a pronounced lift or hike in the middle of the shoe. It is important to locate this notion within the shoe or on the outer portion for hard court or clay surfaces. This will bring the proper weight distribution measures to the foot throughout the course of play. The sport involves a lot of shifty movements, which calls for a support increase. Lacking support in this area will spread the wear across the foot, utilizing the entire foot when only a few areas are necessary for proper play technique and success. The last portion of the shoe that you should keep a selective eye on is the insole. The insole, or insert, should introduce some additional comfort measures. This is accomplished through the addition of memory foam material or a gel-like substance. It should also be thick, due to the wear the hard surfaces can cause. An even pattern is also necessary for keeping proper footing. You may notice an uneven distribution of material and this is a perfectly fine substitute if it comes in the form of additional arch support. These main areas represent important targets due to the increased amount of pressures and instabilities that hard surfaces can possess. The grass surface represents a much softer feel for the user. It also represents the second avenue of challenges that beg for conquering. Grass can be slick, patchy, and will play faster than a hard surface would. This calls for the user to be quick on their feet and be able to make quick shifts and movements. To combat these forces, one needs to heighten their focus on the outsole, lightweight natures, and ankle support. The outsole is arguably the most important feature of a grass-permitted tennis shoe. This area should be relatively flat, with little hike and a thinner support layer. Grass surface offers less resistance than hard surfaces would, calling less for support measures and opting for a greater attention to grips. Grooved surfaces and additional traction submissions mark for a good starting point. 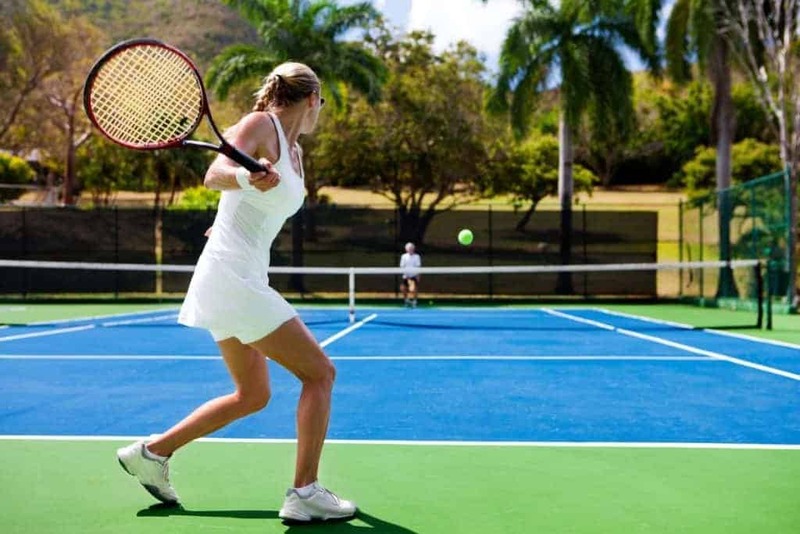 The traction of a grass court is very unpredictable, so it is important to highlight areas of gripping. The bottom should house a pattern of wavy lines or cuts into the support system. This will space out the grips, creating for an even distribution of traction throughout the bottom of the shoe. A thin outsole is also important. Due to the lighter nature of the surface, wear and tear become less worrisome. The focus turns to quick movements and being able to adapt to body shifts. It is a faster-paced surface, calling for an increase in stamina and agility. The thin layer decreases the overall weight of the shoe and reduces the need for proper push-off or landing techniques. Matches played on this surface call for users to be quick on their feet and toes. Ankle support is the last layer of importance on the grass surfacing. Due to the heightened amounts of quick movements, you are going to rely heavily on your ankles. Stability in this area is key to reduce injuries and twists associated with improper movements. A padded back or the addition of simple ankle support measures is a good starting point. It will keep your foot fully housed within the shoe and your ankle in the proper form. After scouring through these product reviews, we promote the Adidas Barricade Club tennis shoes as the best consumer option. Not only does the shoe work for all prescribed surfaces, it heightens the support in the necessary areas needed for both elements. The undercarriage hosts grooves and grippers that will be utilized during push-off, landing, and movements. This allows the user to find stability, no matter the pattern or style of their play. There is also an introduction of multiple forces in the outsole with rubberized materials and gel-like shock absorbers. This helps you stand up to the pressures and elements introduced by the surfaces, preparing you for the course of play no matter the environment. These shoes hold the entire package for a user who is looking to tailor their play across all surfaces.